With an April 8 deadline approaching for a possible shutdown of the federal government, the public remains divided over whether congressional Republicans or the Obama administration would be more to blame if a shutdown occurs. Currently, 39% say Republicans would be more to blame if the two sides cannot agree on a budget and the government shuts down, 36% say the Obama administration, and 16% volunteer both sides. These opinions are little changed from late February. However, opinions are far different now than they were during a similar dispute in 1995, shortly before the government did shut down. In November 1995, a few days before the government shut down, 46% said it would be mainly the Republicans’ fault while 27% said the Clinton administration would be more at fault, according to a Washington Post/ABC News survey. The latest national survey by the Pew Research Center for the People & the Press, conducted March 30-April 3 among 1,507 adults, finds that most (55%) want the lawmakers they agree with on this issue to be more willing to compromise even if it means they pass a budget they disagree with. Far fewer (36%) want the lawmakers they agree with to stand by their principles, even if it means the government shuts down. Republicans are divided over whether to stand on principle or accept a budget they disagree with. Half of Republicans (50%) say lawmakers who share their views should stand by their principles even if that means the government shuts down; 43% say lawmakers should be more willing to compromise, even if that results in a budget they disagree with. Most conservative Republicans (56%) favor lawmakers standing by their principles, even if that leads to a government shutdown. Just 37% of moderate and liberal Republicans favor this approach. 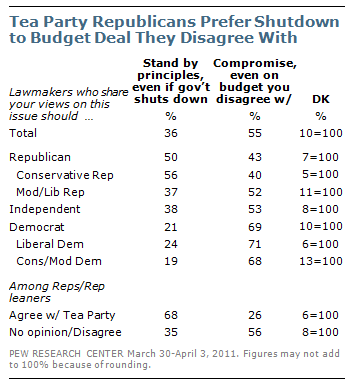 Among all Republicans and Republican-leaning independents, fully 68% of those who agree with the Tea Party say lawmakers who share their views should stand by their principles, even if it means the government shuts down. That compares with just 35% of Republicans and GOP leaners who have no opinion of the Tea Party or disagree with the movement. Democrats are far more unified: 69% say lawmakers who share their views should be more willing to compromise even if that means they pass a budget they disagree with. There are no substantive differences in the views of liberal Democrats and the party’s conservatives and moderates. Independents also say lawmakers should be more willing to compromise (by 53% to 38%). As was the case in February, Republicans overwhelmingly say the Obama administration would be more to blame if a budget impasse leads to a government shutdown; 68% would mostly blame the administration while just 13% would mostly blame Republicans in Congress and 12% would blame both sides equally. By a similar margin (70% to 13%), Democrats would mostly blame Republicans rather than the Obama administration; 12% say both sides are equally to blame. Independents are evenly divided — 34% would mostly blame Republicans while the same percentage would mostly blame the administration. 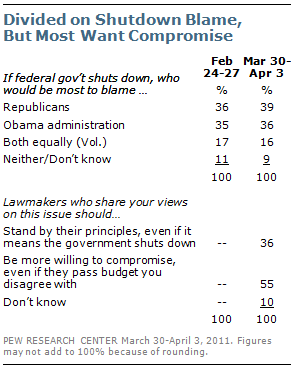 Nearly a quarter of independents (23%) say both sides would be equally to blame if the government shuts down. Find the survey methodology and topline questionnarie at people-press.org.